William Morrow Paperbacks, 9780062103154, 304pp. In Farmacology, practicing family physician and renowned nutrition explorer Daphne Miller brings us beyond the simple concept of "food as medicine" and introduces us to the critical idea that it's the farm where that food is grown that offers us the real medicine. By venturing out of her clinic and spending time on seven family farms, Miller uncovers all the aspects of farming—from seed choice to soil management—that have a direct and powerful impact on our health. Bridging the traditional divide between agriculture and medicine, Miller shares lessons learned from inspiring farmers and biomedical researchers and artfully weaves their insights and discoveries, along with stories from her patients, into the narrative. 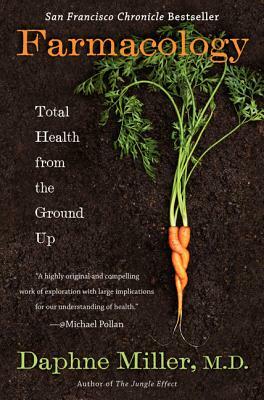 The result is a compelling new vision for sustainable healing and a treasure trove of farm-to-body lessons that have immense value in our daily lives. a vegetable farmer in Washington State who shows us how the principles he uses to rejuvenate his soil apply just as well to our own bodies. Here we also discover the direct links between healthy soil and healthy humans. a beef farmer in Missouri who shows how a holistic cattle-grazing method can grow resilient calves and resilient children. an egg farmer in Arkansas who introduces us to the counterintuitive idea that stress can keep us productive and healthy. We discover why the stressors associated with a pasture-based farming system are beneficial to animals and humans while the duress of factory farming can make us ill.
a vintner in Sonoma, California, who reveals the principles of Integrated Pest Management and helps us understand how this gentler approach to controlling unwanted bugs and weeds might be used to treat invasive cancers in humans. a farmer in the Bronx who shows us how a network of gardens offers health benefits that extend far beyond the nutrient value of the fruits and vegetables grown in the raised beds. For example, did you know that urban farming can lower the incidence of alcoholism and crime? finally, an aromatic herb farmer in Washington State who teaches us about the secret chemical messages we exchange with plants—messages that can affect our mood and even keep us looking youthful. In each chapter, Farmacology reveals the surprising ways that the ecology of our body and the ecology of our farms are intimately linked. This is a paradigm-changing adventure that has huge implications for our personal health and the health of the planet. Daphne Miller, M.D., is a practicing physician, author, and professor of family medicine at the University of California, San Francisco. For the past decade, her writing and teaching has explored the frontier between biomedicine and the natural world. Her widely acclaimed first book, The Jungle Effect, chronicles her nutrition adventures as she travels to traditional communities around the globe. A contributing columnist to the Washington Post as well as other newspapers and magazines, Miller holds a medical degree from Harvard University and an undergraduate degree from Brown University. She lives and gardens in Berkeley, California. Miller’s journey begins in serendipity and remains alive to surprise…[The] web of associations…will surprise even those [who know] that healthy soils make for healthy people. It’s startling to think that few if any doctor-authors have attempted this hybrid of field work…patient case histories…and conversations with scientists. Some of Miller’s discoveries are simple, others groundbreaking, but all feel important for their medical implications as well as for what they can teach us about our connection to other living creatures... Miller... delves deep into the science, translating dense medical text into practical information.